Gustav Holst (September 21, 1874, Cheltenham, Gloucestershire - May 25, 1934, London)   was an English composer and was a music teacher for over 20 years. Holst is most famous for his orchestral suite The Planets. Having studied at the Royal College of Music in London, his early work was influenced by Ravel, Grieg, Richard Strauss, and Ralph Vaughan Williams, however he would eventually develop a highly original style. Holst often looked to English folk music for inspiration but was also influenced by Hindu literature. As a student he developed and interest in Sanskrit texts as well as Indian music. These interests led to a fascination with Eastern mysticism. Like many composers of the early twentieth century, Holst held to the late-Romantic idea that extra-musical sources, such as mysticism, religious faith, mythology, nature and Oriental philosophy were valid ideas on which to base musical expression. His attempts at fusing these diverse influences with traditional "classic" forms were among the first efforts in England to look to non-traditional sources for inspiration. In looking to non-traditional or non-western resources, Holst sought to achieve a harmony and cooperation beyond boundaries and to build musical bridges towards cooperation and peace. No entity's purpose was to exist in isolation. Extra-musical sources were ways to build on an unselfish give and take action. Gustav Holst wrote almost 200 cataloged compositions, including orchestral suites, operas, ballets, concertos, choral hymns, and songs. (See Selected works, below). Holst became music master at St Paul's Girls' School  in 1905 and also director of music at Morley College in 1907, continuing in both posts until retirement (as detailed below). He was the brother of Hollywood actor Ernest Cossart, and father of the composer and conductor Imogen Holst, who wrote a biography of her father in 1938. He was originally named Gustavus Theodor von Holst but he dropped the von from his name in response to anti-German sentiment in Britain during World War I, making it official by deed poll in 1918. Holst was born in 1874 at 4 Clarence Road, Cheltenham, Gloucestershire, England   to a family of Swedish extraction (by way of Latvia and Russia). The house was opened as a museum of Holst's life and times in 1974. He was educated at Cheltenham Grammar School for Boys. Holst's grandfather, Gustavus von Holst of Riga, Latvia, a composer of elegant harp music, moved to England, becoming a notable harp teacher. Holst's father Adolph Holst, an organist, pianist, and choirmaster, taught piano lessons and gave recitals; and his mother, Clara von Holst, who died when Gustav was eight, was a singer. As a frail child whose early recollections were musical, Holst had been taught to play piano and violin, and began composing when he was about twelve. Holst's father was the organist at All Saints' Church in Pittville, and his childhood home is now a small museum, devoted partly to Holst, and partly to illustrating local domestic life of the mid-nineteenth century. Holst grew up in the world of Oscar Wilde, H. G. Wells, George Bernard Shaw, Arthur Conan Doyle, Gauguin, Monet, Wagner, Tchaikovsky, and Puccini. Both he and his sister learned piano from an early age, but Holst, stricken with a nerve condition that affected the movement of his right hand in adolescence, gave up the piano for the trombone, which was less painful to play. He attended the newly relocated Royal College of Music in London on a scholarship, studying with Charles V. Stanford, and there in 1895, he met fellow student and lifelong friend Ralph Vaughan Williams, whose own music was, for the most part, quite different from Holst’s, but whose praise for his work was abundant and who later shared an interest in Holst teaching the English vocal and choral tradition (folk song, madrigals, and church music). Holst was influenced during these years by socialism, and attended lectures and speeches by George Bernard Shaw, with whom he shared a passion for vegetarianism, and by William Morris, both of whom were among the UK's most outspoken supporters of the socialist movement in the UK. It was also during these years that Holst became interested in Hindu mysticism and spirituality, and this interest was to influence his later works, including Sita (1899–1906, a three-act opera based on an episode in the Ramayana), Sāvitri, a chamber opera based on a tale from the Mahabharata, and Hymns from the Rig Veda, in preparation for which he taught himself basic Sanskrit to avoid reliance on the ‘substandard’ translations of the day. To earn a living in the era before he had a satisfactory income from his compositions, he played the trombone in the Carl Rosa Opera Company and in a popular orchestra called the 'White Viennese Band', conducted by Stanislas Wurm. The music was cheap and repetitive and not to Holst's liking, and he referred to this kind of work as 'worming' and regarded it as 'criminal'. Fortunately his need to 'worm' came to an end as his compositions became more successful, and his income was given stability by his teaching posts. During these early years, he was influenced greatly by the poetry of Walt Whitman, as were many of his contemporaries, and set his words in The Mystic Trumpeter (1904). He also set to music poetry by Thomas Hardy and Robert Bridges. 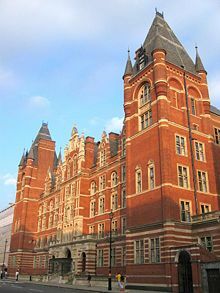 In 1905, Holst was appointed Director of Music at St Paul's Girls' School in Hammersmith, London, where he composed the successful and still popular St Paul's Suite for the school orchestra in 1913. In 1907, Holst also became director of music at Morley College. Those two leadership positions were the most important of his teaching posts, and he retained both posts until the end of his life. During the first two decades of the twentieth century, musical society as a whole, and Holst's friend Vaughan Williams in particular, became interested in old English folksongs, madrigal singers, and Tudor composers. Holst shared in his friend’s admiration for the simplicity and economy of these melodies, and their use in his compositions is one of his music’s most recognizable features. Holst was an avid rambler, walking extensively in Italy and France. He also traveled outside the bounds of Europe, heading to French-controlled Algeria in 1906 on doctor's orders as a treatment for asthma and the depression that crippled him after his submission failed to win the Ricordi Prize, a coveted award for composition. His travels in the Arab and Berber land, including an extensive bicycle tour of the Algerian Sahara, inspired the suite Beni Mora, written upon his return. After the lukewarm reception of his choral work The Cloud Messenger in 1912, Holst was again off traveling, financing a trip with fellow composers Balfour Gardiner and brothers Clifford Bax and Arnold Bax to Spain, with funds from an anonymous donation. Despite being shy, Holst was fascinated by people and society, and had always believed that the best way to learn about a city was to get lost in it. In Gerona, Catalonia, he often disappeared, only to be found hours later by his friends having abstract debates with local musicians. It was in Spain that Clifford Bax introduced Holst to astrology, a hobby that was to inspire the later Planets suite. He read astrological fortunes until his death, and called his interest in the stars his "pet vice." Shortly after his return, St Paul’s Girls School opened a new music wing, and Holst composed St Paul’s Suite for the occasion. At around this time (1913), Stravinsky premiered the Rite of Spring, sparking riots in Paris and caustic criticism in London. A year later, Holst first heard Schoenberg’s Five Pieces for Orchestra, an ‘ultra-modern’ set of five movements employing ‘extreme chromaticism’ (the consistent use of all 12 musical notes). Holst would have certainly been affected by the performance and, although he had earlier lampooned the stranger aspects of modern music (he had a strong sense of humour), the new music of Stravinsky and Schoenberg influenced, if not initially spurred, his work on The Planets. Holst's compositions for wind band, though relatively small in number, guaranteed him a position as the medium's cornerstone, as seen in innumerable present-day programmes featuring his two Suites for Military Band. His one work for brass band, A Moorside Suite, remains an important part of the brass band repertoire. Holst was also influenced by a 19th-century astrologer called Raphael, whose book concerning the planets' role in world affairs led Holst to develop the grand vision of the planets that made The Planets suite such an enduring success. The work was finished in two stages, with Mars, Venus and Jupiter written at one time, and Saturn, Uranus, Neptune and Mercury written after a break that Holst had taken to work on other pieces. The work was finished in 1916. The influence of Stravinsky was picked up by a critic who called it ‘the English Le Sacre du Printemps (Rite of Spring)’. The first of the seven pieces is Mars, ‘the most ferocious piece of music in existence’, evoking a battle scene of immense proportion with its signature 5/4 metre (it changes to 5/2 and 3/4 at the end) and blatant dissonance. Holst directed that it be played slightly faster than a regular march, giving it a mechanized and inhuman character. It is often a surprise to learn that Mars was actually finished just before the horrors of World War I. Mars is easily Holst’s most famous piece, and has been quoted in everything from Carl Sagan’s Cosmos to The Venture Brothers episode, Hate Floats. Calm Venus and self-satisfied Jupiter, both also quite well known, demonstrate influence from Vaughan Williams, Stravinsky, Elgar and Schoenberg. Uranus at first appears to be a quirky and frenetic homage to Dukas’s The Sorcerer's Apprentice, but Holst did not know the Frenchman's score at the time. Neptune is mysterious and evokes an other-worldly scene. Most original is Saturn, in which 'a threatening clock ticks inexorably as the bassline, revealing both the dignity and frailties of old age'. Saturn was reputedly Holst's favorite of the seven movements. Holst lived to see the discovery of Pluto in 1930. Although it was immediately accepted as a planet, Holst chose not to add Pluto to his suite. He seems to have been vindicated by the 2006 decision by the International Astronomical Union to downgrade Pluto's planetary status to that of dwarf planet. A piece entitled "Pluto: The Renewer" was composed by Colin Matthews in 2000, and it has been occasionally included in performances of The Planets. Holst himself conducted the London Symphony Orchestra in the very first electrical recording of The Planets, in 1926, for HMV. Although, as his daughter Imogen noted, he couldn't quite achieve the gradual fade-out of women's voices and orchestra he had written (owing to the limitations of early electrical recording), it was a landmark recording of the work. The performance was later issued on LP and CD format. At the onset of World War I, Holst tried to enlist but was rejected because of his bad eyes, bad lungs, and bad digestion. In wartime England, Holst was persuaded to drop the ‘von’ from his name, as it aroused suspicion. His new music, however, was readily received, as ‘patriotic’ and English music was demanded at concert halls, partly due to a ban on all ‘Teutonic’ music. Towards the end of the war he was offered a post within the YMCA’s educational work programme as Musical Director, and he set off for Salonica (present day Thessoliniki, Greece) and Constantinople in 1918. While he was teaching music to troops eager to escape the drudgery of army life, The Planets Suite was being performed to audiences back home. Shortly after his return after the war’s end, Holst composed Ode to Death, based upon a poem by Walt Whitman. 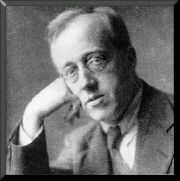 During the years 1920 – 1923, Holst's popularity grew through the success of The Planets and The Hymn of Jesus (1917) (based on the Apocryphal gospels), and the publication of a new opera, The Perfect Fool (a satire of a work by Wagner). Holst became something of 'an anomaly, a famous English composer’, and was busy with conducting, lecturing, and teaching obligations. He hated publicity – he often refused to answer questions posed by the press, and when asked for his autograph, handed out prepared cards that read, “I do not hand out my autograph.” Though he may not have liked the attention, he appreciated having enough money for the first time in his life. Always frail, after a collapse in 1923 he retired from teaching to devote the remaining (eleven) years of his life to composition. In the following years, he took advantage of new technology to publicize his work through sound recordings and the BBC’s ‘wireless’ broadcasts. In 1927, he was commissioned by the New York Symphony Orchestra to write a symphony. He took this opportunity to work on an orchestral piece based on Thomas Hardy’s Wessex, a work that would become Egdon Heath, and which would be first performed a month after Hardy’s death, in his memory. By this time, Holst was ‘going out of fashion’, and the piece was poorly reviewed. However, Holst is said to have considered the short, subdued but powerful tone poem his greatest masterpiece. The piece has been much better received in recent years, with several recordings available. Towards the end of his life, in 1930, Gustav Holst wrote Choral Fantasia (1930), and he was commissioned by the BBC to write a piece for military band: the resulting Hammersmith was a tribute to the place where he had spent most of his life, a musical expression of the London borough (of Hammersmith), which begins with an attempt to recreate the haunting sound of the River Thames sleepily flowing its way. Gustav Holst had a lifetime of poor health worsened by a concussion during a backward fall from the conductor's podium, from which he never fully recovered. In his final four years, Holst grew ill with stomach problems. One of his last compositions, The Brook Green Suite, named after the land on which St Paul’s Girls’ School was built, was performed for the first time a few months before his death. He died of complications following stomach surgery, in London, on May 25, 1934. His ashes were interred at Chichester Cathedral in West Sussex, with Bishop George Bell giving the memorial oration at the funeral. Holst's interest in cultures beyond his own led to the exploration of source materials that would affect his creative output in profound ways. His seminal work The Planets remains one of the great English works of the twentieth century and beyond. His concert band music (The Military Suites and Hammersmith-Prelude and Scherzo) set precedents for the genre and influenced several generations of composers (especially in the United States) in the development of the symphonic wind ensemble tradition. The great American symphonic wind ensembles such as the Eastman Wind Ensemble, the Cleveland Symphonic Wind, the Goldman Memorial Band and the North Texas Wind Symphony owe a great deal to the legacy of Holst's contributions to symphonic band repertory. For a full list, see List of compositions by Gustav Holst. ↑ 1.00 1.01 1.02 1.03 1.04 1.05 1.06 1.07 1.08 1.09 1.10 1.11 1.12 1.13 Britannica Concise. "Gustav Holst," 2006, Concise.Britannica.com ConcBritannica-GHolst.Retrieved March 15, 2008. ↑ 2.00 2.01 2.02 2.03 2.04 2.05 2.06 2.07 2.08 2.09 2.10 2.11 2.12 2.13 2.14 2.15 2.16 Encyclopædia Britannica Online, "Gustav Holst," 2006, Britannica.com Britannica-GHolst.Retrieved March 15, 2008. ↑ 3.0 3.1 HighBeam Encyclopedia, "Gustav Holst," 2006, Encyclopedia.com EncyclopediaCom-GHolst.Retrieved March 15, 2008. ↑ 4.0 4.1 4.2 4.3 4.4 4.5 4.6 The school does not use a dotted "St." in their title "St Paul's Girls' School" (see St Paul's website: SPGS.org). ↑ 5.0 5.1 5.2 5.3 5.4 5.5 5.6 5.7 5.8 "Gustavus Theodore Holst" (biography), Classical Net. 2006, ClassicalNet-GHolst.Retrieved March 15, 2008. ↑ Holst Birthplace Museum website.Retrieved March 15, 2008. ↑ "Gustav Holst (1874-1934) | Compositions" (online), Kenric Taylor, 2006, GustavHolst.info :GHolstInfo-Compositions.Retrieved March 15, 2008. Encyclopædia Britannica Online, Gustav Holst. Kenric Taylor, Gustav Holst (1874-1934). Planeten antikisch German lyrics by Siegfried Carl based upon Gustav Holst op. 32. IMSLP - International Music Score Library Project's Gustav Holst page. This page was last modified on 20 July 2017, at 16:30.